Brother Quotes. i.e. funny and inspirational quotes about brothers. If you are searching for some funny and inspirational quotes on brothers to say or write down, now you don't need to search for them. As here I have compiled down some of the best quotes about brothers. 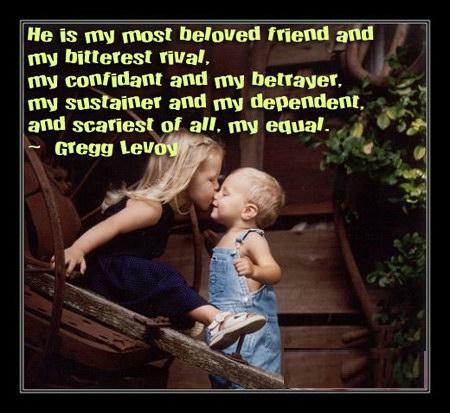 Just hope you will like the quote compilation and able to find some good quotes to say or write about your brother. What strange creatures brothers are! There is no love like the love for brother. There is no love like the love from brother. Forever and ever, kid, until you're sick and tired of seeing me. I have given my word that only death will take me from you. The bittersweet about truth is that nothing could be more hurtful, yet nothing could be more helpful. i miss my brother like the sea would miss salt if that were taken away. Oh, brothers! I don't care for brothers. My elder brother won't die, and my younger brothers seem never to do anything else. You're a great brother. You give us a heart attack worrying about your heart attack, which you didn't even have the decency to have! Brothers and sisters are close as hands and feet. Brothers don't shake hands. Brothers gotta hug. Once you love someone, they stay in your heart forever. He is my most beloved friend and my bitterest rival, my confidant and my betrayer, my sustainer and my dependent and scariest of all, my equal. I smile because you are my brother. I laugh because there is nothing you can do about it.